It’s no secret that LA drivers spend an uncomfortable amount of time sitting in traffic. Workdays, weekends, holidays, late nights – it really doesn’t matter. People in the LA area are so used to being stuck in their cars that we view our vehicles as extensions of our home. So naturally, us LA drivers want all the comforts of home in our cars, but I’ve never been in a ride where all these comforts are available in one giant luxury package. Until I spent a weekend in the 2018 Lincoln Navigator. The 2018 Lincoln Navigator is a giant luxury living room on wheels. It doesn’t feel like a car. It doesn’t feel like an SUV. It’s more like a lobby of a boutique hotel. A rolling spa day that you can take on the freeway. 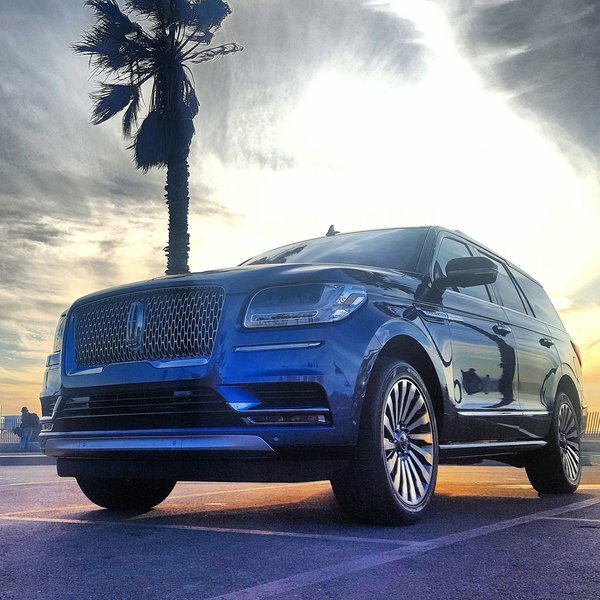 Luxury SUVs aren’t anything new, but the over-the-top comfort, class and refinement available in the 2018 Lincoln Navigator is something I’ve never experienced before. The Lincoln Navigator has been in production since model year 1998. It was Lincoln’s first full-size SUV and it was based on the Ford Expedition that was first produced the previous year. The Navigator was the first Lincoln SUV to offer seating for more than six people and it also offered the greatest cargo capacity of any Lincoln to date. The major distinction between the Lincoln Navigator and the Ford Expedition is that the Navigator was always billed as a more refined machine, an upgrade in terms of trim levels, content and overall luxury. After it first launched, the Lincoln Navigator faced immediate competition the following year when GM responded with the Cadillac Escalade. Although the initial head-to-head sales battle was close, the Escalade ended up taking over as North America’s preferred full-size luxury SUV. The Navigator was revamped in 2003 and 2007 (with a refresh in 2015), but despite shedding its Expedition roots in favor of a design that was produced by the same team that created the 2013 MKZ, the Navigator was unable to take the top spot as America’s favorite huge car for rich people. That’s about to change. This 2018 Lincoln Navigator is something else. Completely redesigned for 2018, the fourth generation Lincoln Navigator is the mobile luxury condo you’ve always wanted, but were never able to afford. It’s gorgeous and intuitive. It’s shamelessly comfortable. It’s the kind of car that you should feel guilty about driving, but, once you start driving it, that guilt melts away like hot wax that contours precisely to snuggle your body in Lincoln’s Perfect Position seats. This full-size SUV is unapologetic luxury at its most indulgent. You don’t reach for the top shelf and feel bad about it afterward. If you’re going for the topmost premium experience, you grab it, enjoy it and feel happy about the fact that you treated yourself. The superlatives roll of the tongue with this ride. It’s the ease of everything that stands out the most. Effortless luxury. Quiet comfort. These Lincoln tag lines never rang truer than with the 2018 Navigator. The Perfect Position seats adjust in a standard 10-way, available 24-way or top-option 30 different positions. That doesn’t even factor in the Active Motion massage chair option. An entire glowing review could be written about just the seat situation, but you get the idea. It really is quite nice just sitting in this car. Back to this effortless luxury thing for a moment. It’s hard to take stock of the many effort-removing features in this car. The list is just so long. The car illuminates when you walk toward it, with the Lincoln star projected on the ground and a welcoming LED halo inviting you to jump in. A simple wave of your foot provides access to the hands-free Liftgate in the back. The 2018 Navigator has memory recall for all your specific seat, audio, pedal and mirror settings. The 10-speed SelectShift automatic transmission makes on-the-fly moves for you so you can seamlessly shift without thinking about it. It just about drives itself. Leveraging the same technology that’s used in digital movie theaters, the Head-Up Display projects information like local speed limit, current speed, time, temperature, miles left in the tank and even navigation directions directly in your line of vision. It’s bright, somewhat distracting, but impossible to miss. Adaptive LED headlamps adjust automatically based on your speed. The rain-sensing wipers activate themselves in wet conditions. Auto Hold does the brake pedal work for you when you’re idle. The Lane-Keeping System alerts you when you start swerving. This car also parks itself with Enhanced Active Park Assist maneuvers out of parallel parking spots with Park-Out Assist. You get alerts when you’re too fatigued to drive or cars are in your blind spot or objects are too close to the front or rear of the vehicle. Active Braking will help prevent you from accidently colliding into people and things. The 2018 Lincoln Navigator will even do your taxes for you. It’s unreal. An effortless living room on wheels wouldn’t be complete without some quality tech options. I mean you have to engage in something while inside these best-in-class interior quietness conditions. The 10” LCD screen is well-positioned and uncluttered in the center stack. It manages to be both non-intrusive and well-within reach. Nestled amid the real wood trim and European leather the LCD screen really completes the overall living room feel. Navigation and music control is easy to deal with, whether you push buttons on the screen, the steering wheel or just use your voice to control calls, music, etc. on the SYNC 3 system. Synching up to Spotify is super easy and an absolute must if you want to leverage the world class Revel audio system that uses Waveguides, Clari-Fi music restoration, QuantumLogic Surround sound and cabin tuning tech to fill your core with rich, dynamic, robust, 20-speaker-strong sound. It’s the kind of music system that keeps you sitting in your car long after you’ve arrived at your destination. There’s a wireless charging pad in the enormous media bin. Six USB ports are scattered throughout the vehicle, including two ports in the third row. You can keep your devices plugged in and they will continue to charge up to 75 minutes after the engine has been turned off. If you need a full 12V power outlet, that’s available in the rear cargo zone. Up to 10 devices can connect to the 4G LTE Wi-Fi hotspot in a 50-ft radius of the vehicle. If you want to tow stuff, there’s 8,700-lbs of best-in-class towing available. If you want to move stuff, you got the best-in-class rear cargo area that leverages a tiered management system where you can partition the cargo space in four different ways. Passengers can stretch out in the best-in-class shoulder, hip and leg room space in the second row. You can sit up to 8 or 9 people in this road-living room. And if you want to admire the stars, the Vista Roof provides the largest panoramic opening in its class. First class. Top drawer. Flawless. Believe the hype. It’s all true. The Escalade had a nice run, but it’s reign of luxury terror is over. A car that costs nearly $100K when fully loaded should feel like a $100K driving experience. Whether you go with the base level, select or premium reserve options, you’re going to feel like a celebrity hosting a swanky party every time to drive around the block in this unquestionably luxurious mobile living room. A few weeks ago, I got a close look at the 2017 Continental at the Bel-Aire Hotel with Lincoln Design Director David Woodhouse and Chief Engineer of the Continental, Michael Celentino. From the start, Woodhouse and Celentino were lockstep in describing the overall vibe of the car with a slew of words that highlighted the “quiet luxury” approach that’s at the core of Lincoln’s revamped marketing approach. Elegant. Serene. Warm. Beautiful. These words just rolled off the tongue of Lincoln’s design director. And he’s not wrong. The 2017 Continental is all of these things. Maybe it was the British accent, the younger Jonathan Pryce-like delivery or the aptness of the adjectives, but I found myself agreeing with Woodhouse quite a bit. Meeting this car for the first time is an experience worthy of hyperbole. Celentino was quite convincing as well. He described what went into the four and a half years of development to bring back a Lincoln worthy of the name Continental. Celentino and his team spent a lot of upfront time trying to figure out a direction. They drew a lot of inspiration from some of the iconic Continentals of old. Frank Lloyd Wright’s 1940 Lincoln Continental. The Continental Mark II of the 1950s driven by Frank Sinatra. And the long presidential Lincoln Continental of the 1960s made famous by JFK. 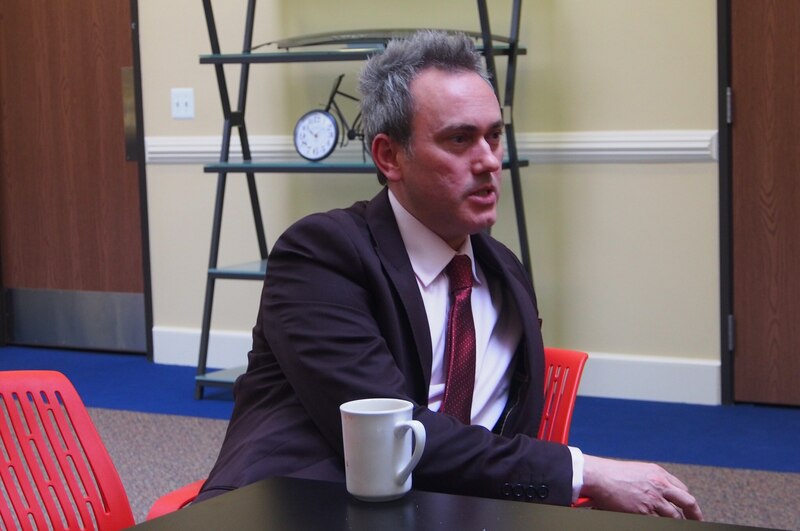 “We deliberately went down this middle road to find that balance,” Woodhouse explained. According to Woodhouse, the new signature face of Lincoln happened through this program. This was a big source of inspiration as the Continental was being developed. That grill, though. It just works. 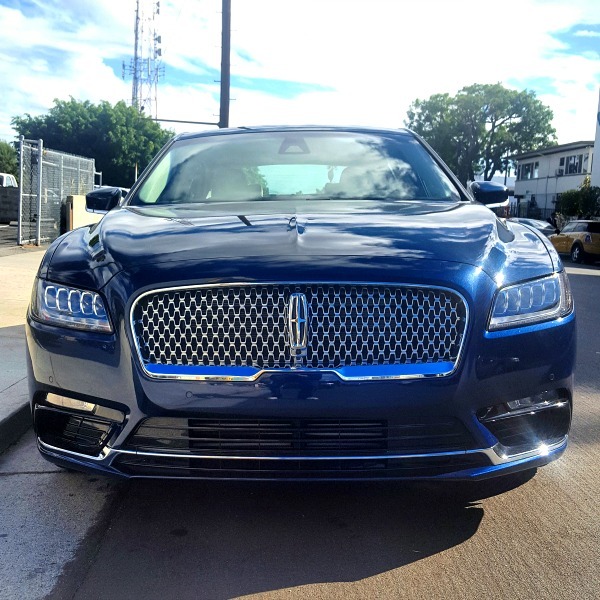 With all the elegance and serenity and other superlatives at play, the front face of this Lincoln Continental is its most distinctive feature. There’s no way around it, this car is handsome. The 2017 Continental comes in 2.7 L V6, 3.0 L V6, 3.7 L V6 options that vary from 305 to 400hp. Full specs can be found here. But let’s face it, if you’re looking to get a Lincoln Continental of your own, specs aren’t your primary concern. Specs are nice and all, but as Celentino explained, “the emphasis is on smoothness and smooth shifts.” This is still a 5,000 lb. car. With adaptive front steering, adaptive cruise control, auto hold brake and tires that shift to guide you through turns, Continental’s chief engineer just wants drivers to enjoy the ride. “When you’re on the 405, just calm down and let the car drive,” Celentino said. Both Woodhouse and Celentino admit that Lincoln is not trying to chase their top rivals in the luxury space. To them, performance is important, but to focus strictly on performance is so very German. Lincoln’s approach to luxury is different. And the wellness is real. From the first glance, you can see it. There’s the “relaxed gesture from front to rear” and “right stance and gesture on the road” that Woodhouse described to me. There’s the soft release of the electronic door latching, the first touch point of the car. At night, drivers and passengers are treated to a friendly embrace as they approach the Continental. This warm hello comes in the form of extra floor and interior lights that illuminate before you enter the car. In short, the 2017 Lincoln is basically a high-end day spa on wheels. And that was very much the intention. That approach is what gets you things like the 30-way adjustable Perfect Comfort Seat. You got options for upper and lower back adjustments, massage time and thigh adjustment. Drivers tend to place more or less weight on one leg all the time. Setting each leg at a different stance is just another way to settle into this comfy living room chair that just happens to live in a car. Woodhouse said that people didn’t want to get out of the seats during testing. I believe it. It’s a lot like leaving the massage chair in Brookstone when your lady wants to keep shopping at the mall. You just always end up wanting a few more minutes in that seat before you go about your business for the day. 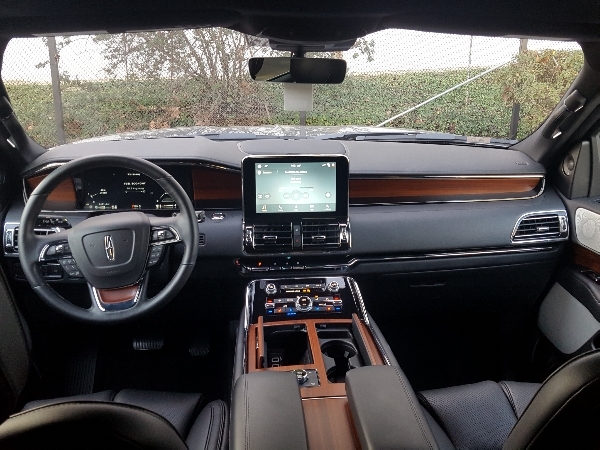 But you can’t have quiet luxury without the quiet, and as Celentino described, the 2017 Continental is “the quietest Lincoln ever.” Acoustic glass is found all around, including the back, because the back cabin is equally important in this car. This focus on comfort in the back was a product of market research, specifically in China. Both Woodhouse and Celentino were keen to underscore the influence of Chinese market sensibilities in the design and development of the new Continental. In China, luxury car customers are often driven around during the week and drive themselves on the weekends. This caused Lincoln to pay more attention to the rear passenger experience. The result was the rear seat amenities package. The goal is to maximize controls from the rear seat. Things like full recline, massage, heat, lumbar support, Revel audio controls and available USB are in the mix. Customers in China can feel all the comforts of the Continental no matter where they’re seated, whether they’re leveraging the quiet rear cabin for a business meeting, being driven around long distances or taking the wheel themselves. China was the third country to see the 2017 Continental, after Lincoln launched in the US and Canada, so the market is clearly an important one for the American brand. According to Forbes, Lincoln’s sales in China were up 191% year over year in the third quarter of 2016. Celentino said that China will be the biggest luxury market in the world by 2019 or 2020, and Lincoln plans to have 60 dealerships open in China by the end of the year. Part of my day out with the 2017 Lincoln Continental included a visit to The Village Studios, a former masonic temple that was converted into a recording studio in the 1960s. 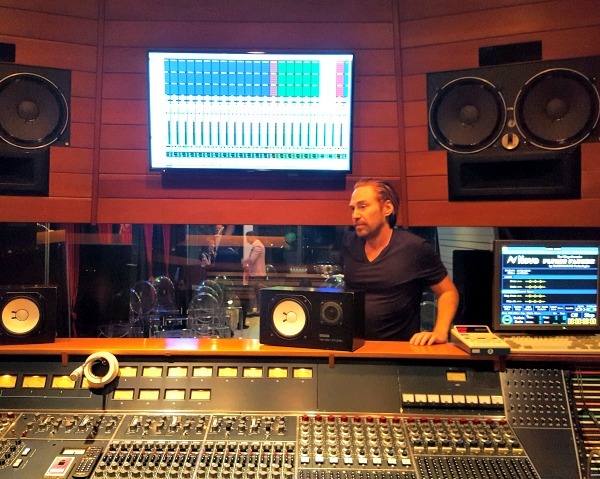 Located just off Santa Monica Blvd, right near the 405 in West LA, The Village has been home to some pretty amazing recording sessions. The Stones recorded “Angie” there. Heart recorded “Barracuda” there. This is the spot where Dr. Dre and Snopp Dogg recorded the Chronic. We met up at The Village with electronic music producer Photek and previewed the Revel audio system, a major highlight of the 2017 Lincoln Continental. Perched in front of a sweet, 48 channel Neve Mixing Console that was built in 1972 and shipped over years ago from Chicago, Photek broke down a few tracks for us, going through the different component parts of two remixes (including Photek’s remix of “One Love” from Bob Marley and the Wailers) and a new track he was working on. And what better way to preview a working track than a day spa on wheels with the best in-car sound system ever created? Seriously though, the Revel sound system in the 2017 Lincoln Continental is no joke. Revel has an exclusive deal with Lincoln and rolled out their first car sound system in the MKX. The Revel team dictated the placement of all 19 speakers in the car. The attention to detail is just unimaginable. Imagine a car stereo system where all sounds it each passenger at the same time a magnitude. Where smooth distribution of high frequency sounds is a goal of in-door waveguides. Where shorting rings provide a sound so crisp you’ll hear parts of songs you never knew where there. Where you can adjust your experience to listen to stereo, onstage or audience modes. Now imagine a sound system that actually uncompresses your music files. This is the next level quantum logic system from Revel that’s in place in the Conintental. All your compressed MP3 files and streaming music sources are injected with a fullness that opens up frequencies and provides a richer sounding listening. It’s great way to earn back those frequencies we all tend sacrifice in the name of convenience. If you’re not a fidelity nerd and you don’t care about frequencies and waveguides and distortion and all that, that’s okay. You don’t really have to worry about that stuff. Revel spent the last 19 years trying to sort it all out. You just need to know that this is the best sound system you’ve ever experienced in a car. Period. The entry price for the 2017 Lincoln Continental is about $45,000. The price point gets into the high 70s for the super sweet Black Label rear seat amenity loaded Continentals that I checked out. If you’re into being comfy in any seat, enjoying a smooth ride in a dapper car with some serious history or if you just love music so much that you want to spend more time listening to tunes in your car than living life outside of it, the first Lincoln Continental to come out since 2002 is definitely worth checking out. Last month I got to take the 2017 Lincoln MKZ out for a drive around LA. The day started with a lunch at Broken Spanish, a hip spot near the Staples Center where Chef Ray Garcia reimagines classic Mexican dishes with a modern touch. The folks at Lincoln wanted to make sure we were all properly fed before testing out the MKZ, and fed we were. Calabacitas tamal, campechana, ensalada verde, ensalada rusa, birria, ridiculously tasty guac, tres leches cake – you get the idea. It was almost too much, but nothing could go to waste. Even after I hit capacity, the grub was too good to pass up. During lunch, I met Solomon Song, the Exterior Design Manager for the MKZ. When Song spoke to the group, he introduced himself by saying “I’m a little quirky.” I found his quirkiness entertaining and his passion for design refreshing. Song described the amount of detail that went into designing the exterior of the MKZ, which was first introduced in 2013. From the refractive quality of the headlamps (which were inspired by crystal chandeliers and vases) to the need for “quiet luxury” (an appreciation of the finer things that embraces understatement and shies away from in-your-face swagger), Song spoke about the MKZ like a proud parent. “Treat it like a rocket ship,” he said, where every detail is a painstaking decision but function leads the way. Song spoke of the human to machine interface that really defines the driving experience. He also stressed his focus on depth as a core point of design emphasis. He highlighted the tight radius in the front of the car flowing into the bigger radius in the back – pleasing lines that he likened to a well-tailored suit. 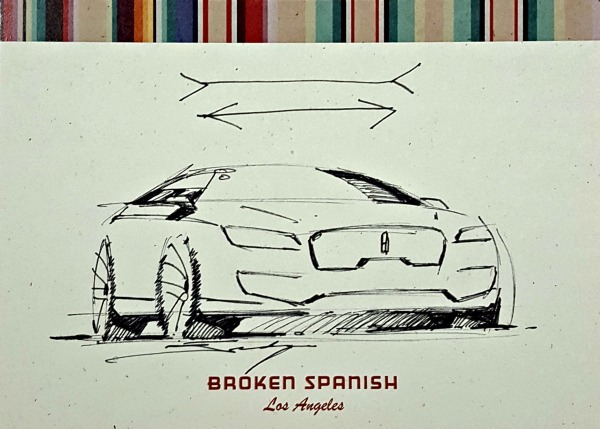 While most of the media folks in attendance powered through course after course at Broken Spanish, Song sat down with a pen and produced MKZ sketches for everyone. The proud parent’s joy was on full display when Song sketched out the familiar lines of the MKZ from memory. Song’s partner in crime is Tom Ozog, the Chief Program Engineer for the MKZ. As Song put it, Song gets to come up with the concepts, like a retractable glass roof, and Ozog has to figure out how to execute it. 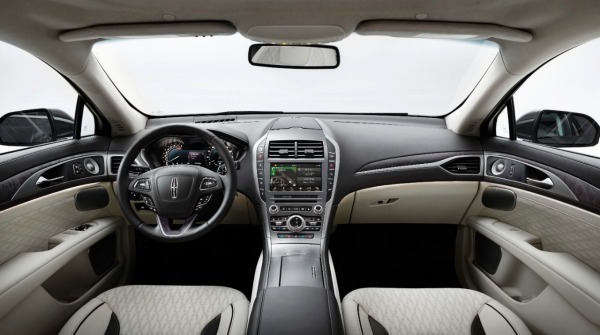 Continuing with the “quiet luxury” theme, Ozog underscored the isolation from outside noises in the cabin as a core part of the MKZ experience. “Quality is quietness,” Ozog explained. He encouraged all the folks who would be testing out the MKZ to pay attention to this important feature. Ozog also emphasized the exterior design, overall craftsmanship and the “effortless performance” of the driving experience as distinctive features of the new MKZ. After the good eats and introductory chats, it was time to hit the road. My destination was Hammer & Nails, a manicure/pedicure salon for men located in West Hollywood. I’ve never gotten a manicure before, so that was an interesting bit of man-pampering that I got to experience. If you’re a guy and you need to up your hand/food grooming game in a chill environment with cool people, check em’ out. The 2017 MKZ Reserve AWD was my ride for the day. It came in Magnetic Grey Metallic with an Ebony Leather interior. As advertised, the overall luxury look-and-feel of the car definitely came with a dose of subtly. It’s clearly in the luxury class, but it doesn’t need to try too hard to flaunt this distinction. The outside lines are pleasing and display a certain depth, something I was keen to look for after chatting with Song. The interior cabin is a like a tastefully designed living room. Nothing gaudy. No gold and marble. Just cozy and comfortable with a touch of class. The MKZ had a few features that I knew I had to test out. The first was Auto Hold, a system that allows you to remove your foot off the brake when the car is idle. I was initially hesitant to activate this feature, as I can be pretty absent minded and clumsy at times. After working up a bit of courage, I gave it a go. It’s the type of feature that you wouldn’t think is really necessary. I’ve been leaving my foot on the brake when idle my whole life, so I never thought about active foot pressure being an inconvenience. After flipping the switch though, I never went back. It’s a subtle indulgence that may seem unneeded, but being able to chill at a red light and adjust your comfort level without having to worry about the brake is really quite nice. There’s no hiccup when you want to press the gas and go. It’s all pretty seamless. Another feature that I was keen on testing was the Active Cruise Control. I’m not really a big cruise control guy. I get that it can be convenient for long road trips, but just like using my foot to control the brakes, I’m pretty used to actively driving cars without assistance. With Lincoln’s ACC, the cruise control senses traffic slowing ahead and reduces your speed to maintain a preset distance automatically. Your cruising speed resumes when traffic has passed, which is nifty. AAC also includes forward collision warning with brake support. This feature flashes a heads-up display to warn you of potential impact and even pre-charges/increases the sensitivity of brake assist to provide a more responsive braking situation if you’re about to smash into someone. Any review of the MKZ wouldn’t be complete without a discussion of the Revel Audio System. The MKZ comes in 14 and 20 speaker options. I’m glad I got the 20 speaker Ultima setup. I just got back from Spain so I was keen on bumping some tunes that I picked up at the Rastro. Like this record. Pairing my phone up to the Revel Audio System was super easy, and I was blasting travel tunes in no time. The sound system really is a major selling point here, especially with the overall quietness of the cabin helping to isolate the sounds you actually want to hear. No matter what seat you end up in, you’re going to get a crisp, rich audio experience in this ride. It also helped that the redesigned control panel was as intuitive as advertised, allowing me to jump from Spotify playlists to the navigation map with ease. There’s a lot to like about the new MKZ: the understated luxury, the signature grille, comfort and quality sound for all passengers, clean lines, a fully retractable panoramic glass roof. You can’t argue with 41 city/38 hwy/40 combined mpg from the 2.0L Atkinson-Cycle I-4 Hybrid Engine either. It’s the little things that go a long way with this car, and with releases like this, it’s easy to understand why Lincoln is experiencing double-digit growth in year-over-year sales. Lincoln is back, baby. Once a shining leader in the American luxury car space, Lincoln hit some hard times a few years back. U.S. sales fell to a 32-year low in 2013, but the brand bounced back in a big way. The introduction of the MKC crossover propelled a 16 percent year-over-year sales increase in 2014, making it the fastest-growing luxury brand in the U.S. that year. This upward domestic sales trend continued last year, and with six months of sales figures in the books for 2016, the positive trend continues for the luxury-focused company that was founded in 1917 and has been a subsidiary of Ford since 1922. A big part of the brand’s resurgence can be attributed to a renewed focus on “The Lincoln Way.” I learned more about this approach when I met up with Andrew Frick, Director of Sales and Service Operations this past week at the new Lincoln Experience Center located inside Fashion Island in Newport Beach (139 Newport Center Dr, Newport Beach, CA 92660). Frick is a tall, affable dude who’s quick to smile and has a sense of humor that’s as clever as Lincoln’s new brand messaging. The gist of “The Lincoln Way,” as Frick described it, is creating a “warm, human, personally crafted” experience for car owners. The words rolled off his tongue quite effortlessly and he revisited this central approach frequently when describing the new Lincoln Experience Center. Officially launching this weekend, the Lincoln Experience Center is a comfortable, 5,200 sq. ft. space that provides visitors with immersive, tactile opportunities to explore the Lincoln Way. “Our brand is in a better place than the perception of the brand locally,” Frick said. The purpose of the new space is to change that perception. Situating the space in an area with high foot traffic with a local demographic receptive to luxury car buying also helps. Visitors can pop in and get a break from shopping by chilling (or working with Wi-Fi) in the lounge with a complimentary beverage. 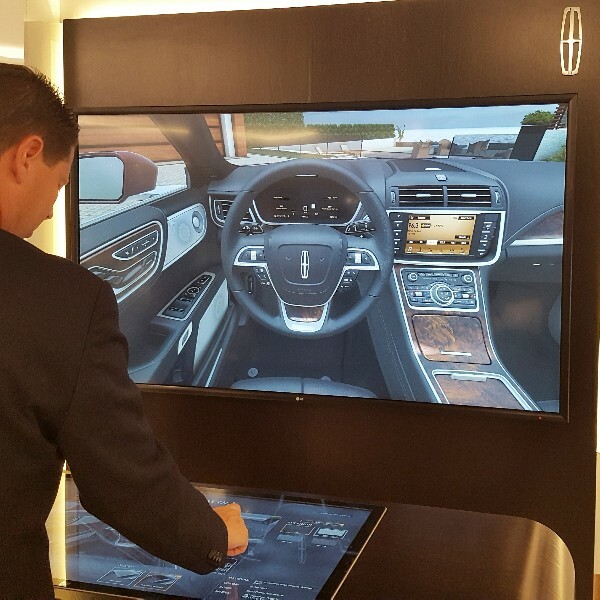 Tablets and a large, interactive Technology Wall are available so that guests can learn more about new Lincoln models and explore features and options. Cycling through colors, environments, wheel variations, roof options, interior color tones, back seat views, etc. in real time is a great way to expose more people to the brand’s offerings. An app is in the works as well and will likely be released in this fall. Guests can also take in different design inspirations, schedule a test drive (or a more extended “date night” 24-48 hour weekend test drive) and visit the Revel Audio room to get a first-hand feel for the sound system’s capabilities. As Frick mentioned, “we sell a lot of vehicles because of the sound system,” and the audio room at the Lincoln Experience Center helps explain why. Visitors can also inquire about guaranteed pickup and delivery services (available for owners of new 2017 model-year Lincolns), leasing and finance options or even Skype directly with dealerships. Frick went on to explain that “the plan is to learn from this environment” with the goal of opening similar spaces up in the near future. These types of environments also allow the brand to “do business on clients’ terms in ways that are important to them,” according to Frick. The Lincoln Experience Center will also be used to host events in an effort, as Frick put it, to “engage the local community and support local businesses.” Visitors can reserve spots for events that will feature everything from musicians, artists and jewelers to chefs, sommeliers and cheese mongers. 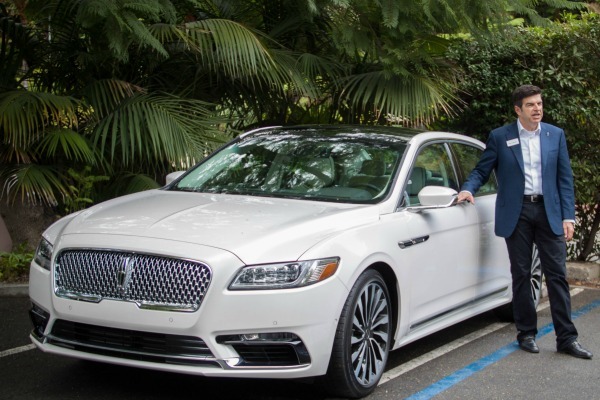 This program to deliver culture and luxury outside of the vehicle is part of Lincoln’s plan to reassert itself in the luxury car space in a way that’s more “warm, human and personally crafted” than a trip to your local Lincoln dealership. One of the bigest things I took away from my visit to the Lincoln Experience Center and my conversation with Frick is that most luxury car owners don’t really want to get into the specs of a high performance, luxury vehicle. Horsepower, torque – not so important. The actual driving experience and the specifics of the luxury options available — like the curated Lincoln Black Label Collection or the Revel Audio sound system or the new Perfect Position Seats – these are the things that luxury car buyers in the America really care about. 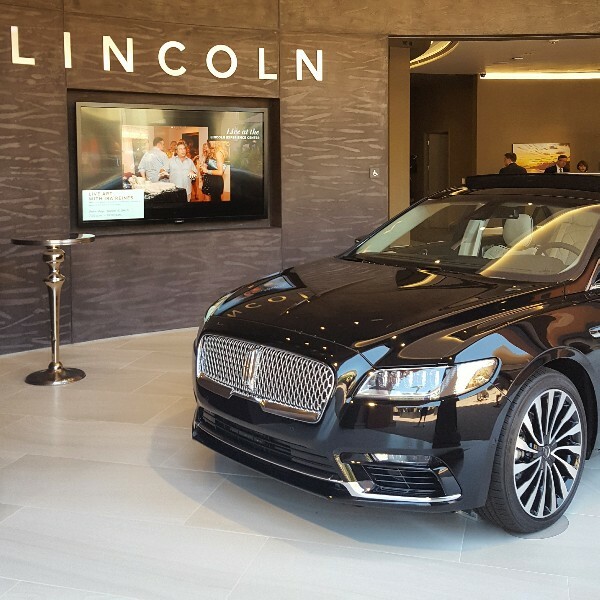 If you’re curious about the Lincoln Way, the 2017 Lincoln Continental Concept or just you want to find out more about different Lincoln models and options as you sip a free glass of champagne, go check out the space (139 Newport Center Dr, Newport Beach, CA 92660).